After only our second ever season, AFC Unity consolidated our position in Division Two by finishing – after a goal drought and brief break – with two spectacular victories. 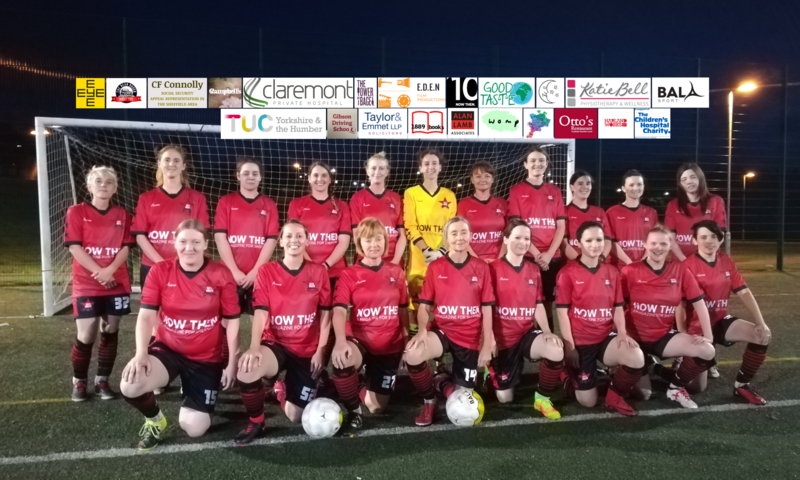 Against a Sheffield Wednesday Development team with nine players, our Red Stars put an unprecedented thirteen goals past the Owls, winning 13-1 on March 13th to achieve the biggest victory in AFC Unity’s history. One week later, on March 20th, it was 9-1 against ten-player New Bohemians. The following night at The Circle – AFC Unity’s registered office – saw our official Awards Night, honouring players and other personnel, from volunteers to coaches, as well as the launch of our expanded Football for Food project now that home league games are over. And the Awards Night saw not only a talk from Nick Waterfield from Parson Cross Initiative – one of the food bank bases benefiting from Football for Food this season – but players contributing food donations one more time to mark the kick-off of the expansion project, which, as co-founder Jane Watkinson announced, will see a series of events take place to raise not funds but food. Given Unity is an “alternative football club,” the awards and their titles were given a little twist on tradition. Midfielder/forward Jodean Wadsworth was awarded the Hope Over Fear Award by manager Jay Baker, who had until that point resisted picking out a single player. 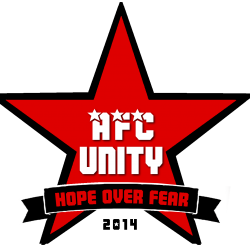 But since AFC Unity have been regarded underdogs for so long, this – it was explained – was for the underdog of the team who throughout the season turned negatives into positives and demonstrated faith in the manager’s vision. Baker told of how Jo had rapidly risen through the ranks, from the Development programme, into the first team, scoring two goals in her debut in a pre-season friendly, and overcoming challenges through the whole season. Players themselves had the opportunity to vote for their own player of the season, and after the vote count had ended, midfielder and top goalscorer Shanie Donohue had emerged as the clear winner. Keeping in mind factors such as attitude, ability and attendance while representing the club well, Shanie was chosen by her teammates and captain Jane Watkinson presented this award, speaking on behalf of the team to praise Donohue and and announce her as vice-captain for next season following the retirement of previous vice-captain Sarah Richards. Defensive player Sophie Thomas was picked for first team coach Olivia Murray’s Breakout Award, for notable improvement throughout the season as what Olivia called ‘an unsung hero.’ Factors such as development in physical, psychological, technical and social areas were all taken into consideration in Murray’s selection. Supporters and volunteers from around the club had the chance to pick their own player of the season for efforts on and off the pitch, and this one went to Sarah Richards. Appropriate, then, that the award was presented by Nick Waterfield from Parson Cross Initiative, which had been visited and promoted by Richards over the season to raise awareness of their efforts to tackle food poverty. ‘The ITV Calendar interview clinched it,’ joked a modest Sarah. Charlotte Marshall – who came into AFC Unity as a volunteer via the Venture Matrix programme at Sheffield Hallam University, being a director as well as a welfare champion and player – earned herself the Integrity Award for standing up for the club’s ethos and making difficult decisions in tough times, showing a commitment and dedication to setting a positive example to others. Sarah Richards, who had joined AFC Unity early on, as well as first team coach Olivia Murray and Development coach Jonny Hodgson, were all presented with prestigious Solidarity Awards as selected by management and the Board of Directors. Sarah, who recently announced she was hanging up the boots, had played for several teams before taking a break, only to get back into action via AFC Unity, quickly making an impression enough to become vice-captain and even making the bold claim that if AFC Unity had existed when she was younger, she’d have likely stayed at the club permanently. Olivia was recovering from a serious injury in high-level football when she joined AFC Unity. Being an assistant coach in the first season, she became first team coach for Unity’s second season and eventually moved on to the Board of Directors, where she now remains as Chair despite moving on from coaching. Jonny is also moving on, but was the very first coach AFC Unity had – so crucial was this initial voluntary position, the co-founders stated that the club would not exist as we know it without his involvement from the beginning. He eventually moved into the paid role of Head Coach of Development, a programme which has seen several players progress into affiliated football. Volunteers were also presented with certificates for their time and efforts, and manager Jay Baker honoured each and every player, presenting them with Red Star Awards, and noting, ‘As of this night, we’re the only team with not one, not two, but three players in the top ten goalscorers of Division Two – because we work together as a team, and everything is a team effort, and our attacking style means goals can come from anywhere,’ before later referencing the community focus of the club: ‘When you’re only about winning, if you lose, you have nothing left…but we always have plenty left.’ The players also thanked him, and first team coach Olivia Murray, for their efforts over the season, surprising them with tokens of appreciation, for which they were very grateful. Congratulations to everyone who made this season so special!